The City on the Edge of Forever. This episode originally aired during Season 1 on Thursday, April 6, 1967. Under the influence of drugs, Dr. McCoy plunges through a time portal and into the New York City of the 1930’s. Kirk and Spock follow him, fearing that the drugged medical officer might commit an act that will alter the course of history. While trying to find McCoy, Kirk falls in love with Edith Keeler, a charity worker helping victims of the Depression. Kirk doesn’t know exactly what McCoy is about to do, but he has learned that the doctor’s actions could prove fatal to Edith. The City on the Edge of Forever is one of the most popular and critically acclaimed TOS episodes. Gene Roddenberry, William Shatner, Leonard Nimoy and DeForest Kelley all picked this as one of their favorite episode. Entertainment Weekly named “City” as #1 of all Star Trek episodes. In the July 1, 1995 issue, TV Guide ranked “City” at #68 for their list of 100 Most Memorable Moments in TV History. Originally conceived and written by science fiction writer Harlan Ellison, this episode was the cause of a lifelong split between friends Ellison and Roddenberry. Ellison claimed Roddenberry ruined his story while Roddenberry claimed that Ellison’s script “was a brilliant piece of work – if there had been no Star Trek pattern to follow. But, by the time of this episode, we had laid down who our people were…” The battle between Roddenberry and Ellison was both vocal and public. Dynasty’s Alexis Morrell Carrington Colby Dexter Rowan, aka, Joan Collins, played Kirk’s love interest Edith Keeler. 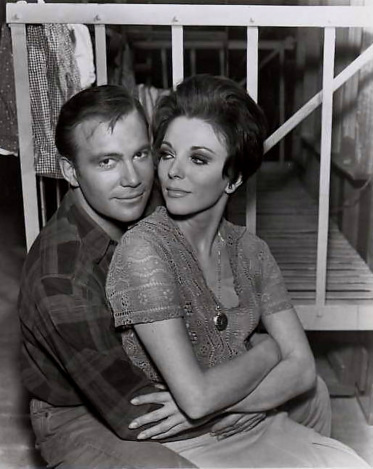 The producing team was thrilled that an actress of her stature would be part of the episode; her chemistry with Shatner conveyed a tremendously tragic love story. The $245,316 spent to produce “City” made it the most costly episode of the original series. This equates to over $1.7 million dollars today. The production was more than $60,000 over budget. Think $422,000 today just in overage. Excellence comes at a price. In honor of its broadcast anniversary, watch the original episode (try amazon.com, Netflix or hulu plus) in a whole new way by reading all of the great behind-the-scenes details in Marc Cushman’s These are the Voyages: TOS, Season One. Get your copy today!